John Akomfrah, Purple, 2017. Six-channel HD color video installation with 5.1 surround sound; 62 minutes. 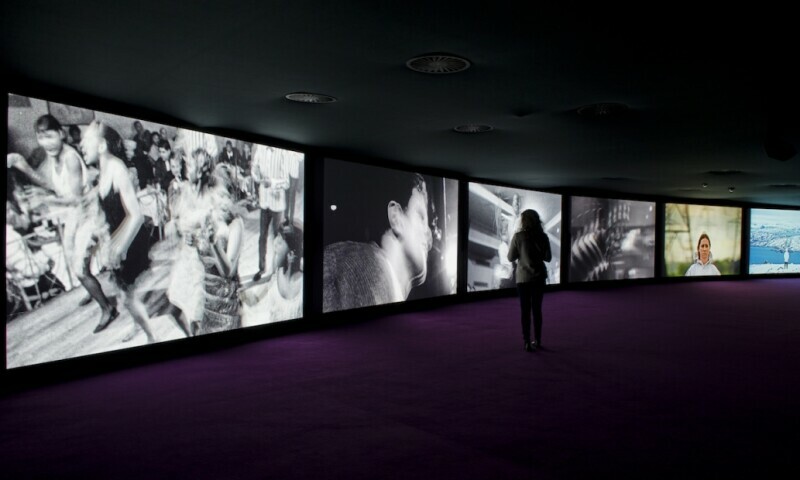 Installation view, John Akomfrah: Purple, Museo Nacional Thyssen-Bornemisza, Madrid, 2018. The next season of the Watershed, ICA Boston's new project space in East Boston, will open with the U.S. premiere of Purple, an immersive six-channel video installation by acclaimed British artist and filmmaker John Akomfrah. The artist’s most ambitious project to date, Purple combines archival footage with newly shot film to address themes related to the implications of climate change across the planet and its effects on human communities, biodiversity, and the wilderness. Sited in the Watershed’s industrial building, the themes of Purple resonate deeply with the Watershed’s harbor location and its proximity to the current and historical maritime industries of the Boston Harbor Shipyard and Marina. On view May 26 through September 2, 2019, John Akomfrah: Purple is organized by Eva Respini, Barbara Lee Chief Curator, with Cara Kuball, Curatorial Project Manager. Akomfrah draws from hundreds of hours of archival footage, combining it with newly shot film and a spellbinding sound score to produce the video installation. Symphonic in scale and divided into five interwoven movements, the film features various disappearing ecological landscapes: from the hinterlands of Alaska and the desolate environments of Greenland to the Tahitian Peninsula and the volcanic Marquesas Islands in the South Pacific. Purple conveys the complex and fragile interrelation of human and non-human life with a sense of poetic gravity that registers the vulnerability of living in precarious environments.